This little blog has been pretty quiet lately! That's not to say a lot of sewing hasn't been going on. I guess with the arrival of instagram, I, like many other sewers who have blogs have been blogging less. Instagram is great because it's so quick and easy but sometimes I like things to be here too! 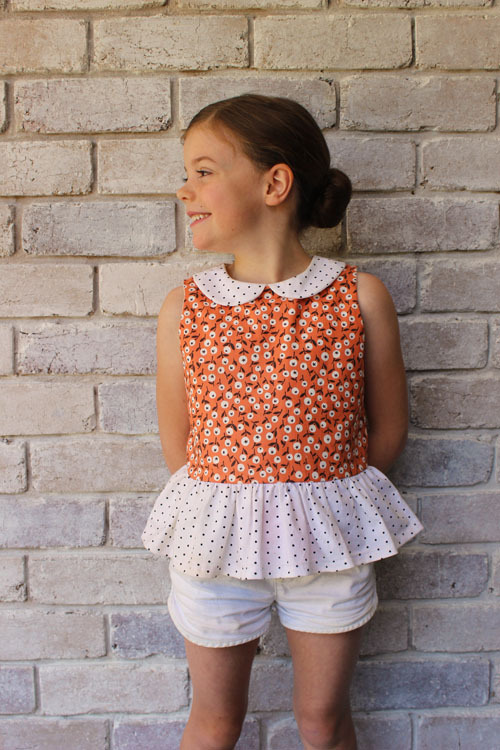 So my first blog post for 2019 is a little top I made Emily. We have been enjoying warm weather here (sometimes too warm), and the girls are on school holidays. I love this time of year when they can play outside until bedtime and our days are free and easy. I have been doing a lot of tidying these school holidays which has included going through my sewing room and sorting fabrics and patterns. I have rediscovered fabrics I had forgotten about and I found this sweet little orange print that my sister gave me which was leftover from a quilting project of hers. The selvage wasn't on the remnant I had and it was a small piece. I love it so much that I wanted to make a garment out of it, but only had enough for a small bodice. Since Emily is still in size 5 sewing patterns, I managed to squeeze a tic tac toe bodice from it. 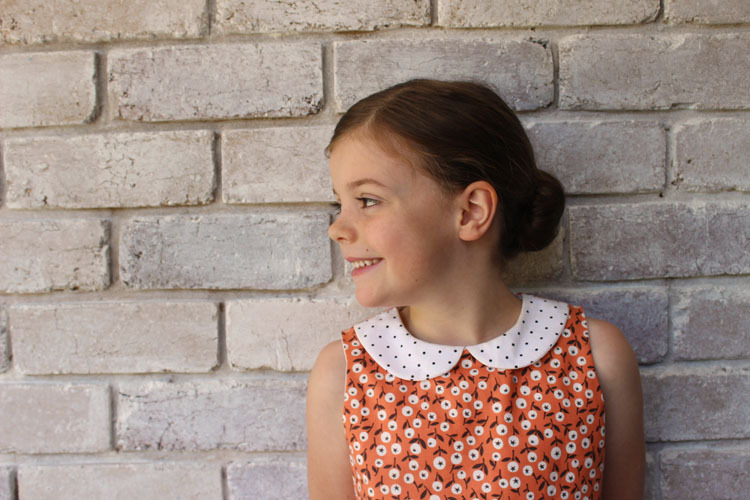 I paired the print with a white and black polka dot fabric I had from an op shop. 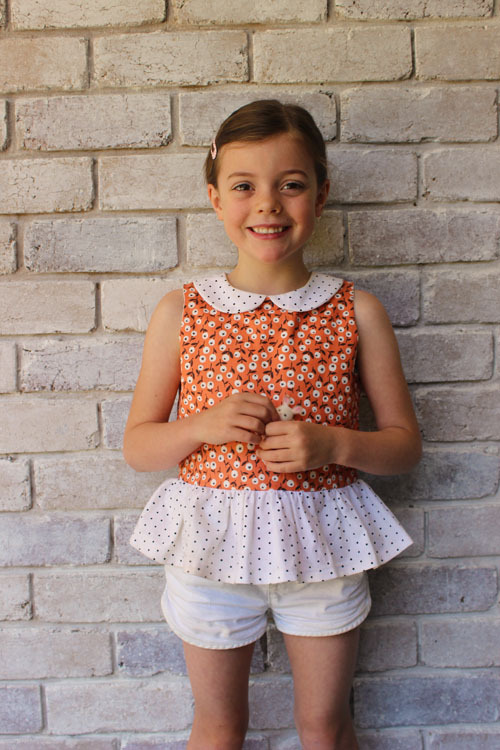 Emily has been enjoying wearing shorts this summer so I decided to make her a top. I used the half collar of the tic tac toe pattern and just made two gathered rectangles for the peplum frill. Since I have been tidying out my fabrics, I am also trying to use things up before I buy more. So I used a regular zip and exposed all of it. To do this, I subtracted 1cm from either of the centre backs to create an opening, then I sewed the zip on top. I left the centre back necklines open by 1-2cm to allow the top of the zip to sit inside the neckline, then I top stitched it shut when top stitching the zip to the top. I had to take care sewing the peplum frill to the bodice around the zip, but my sewing machine handled it ok! 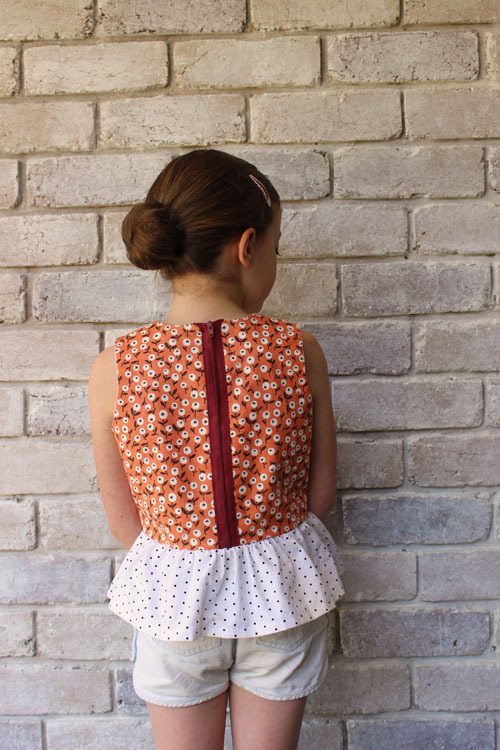 Changing the tic tac toe dress pattern into a little peplum top was such an easy alteration and I really love how it turned out. Emily LOVES this top and has worn it so much already. It looks sweet with shorts and jeans too.